“My wife and I had decked up Aakankha’s room with so many toys. We were so excited thinking about how our life would revolve around our little baby but now we are just hoping that our baby survives. She's struggling to even breathe and I can't bear to see her in this condition. She is a little warrior, she survived severe respiratory problems for a month. But as a father, I'm failing her. I don't know how I can help her to continue the treatment. 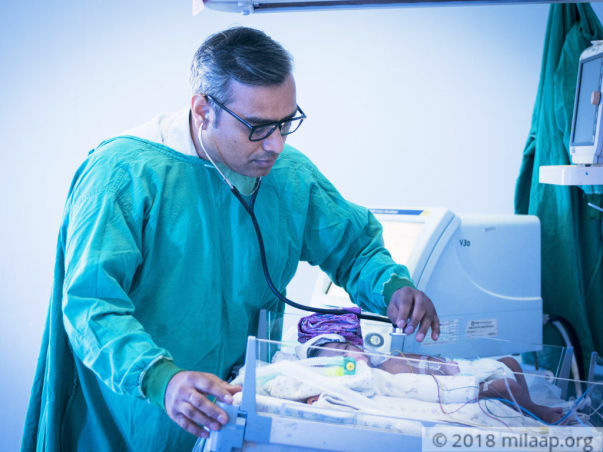 I wish there was something in my hands that could make her feel even a little better.” Ashish Nandi, father of Aakhankha said as he wiped tears off his face. 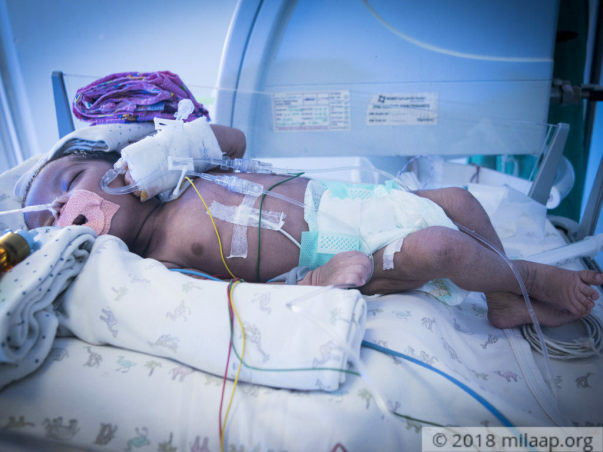 1-month-old Aakankha has severe pneumonia. She cannot breathe at all and needs constant support to survive. 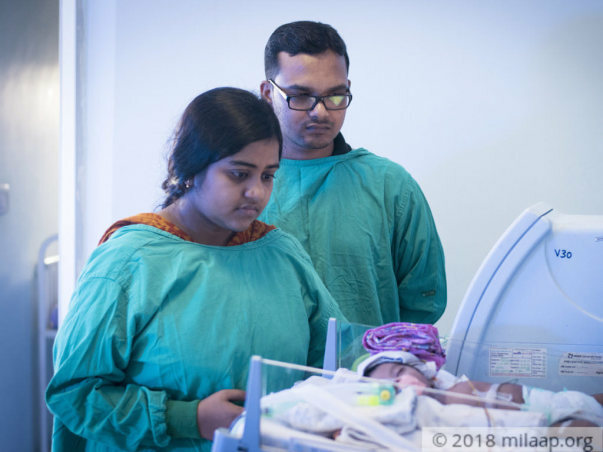 Her left lung is completely affected by a viral infection and the only hope for baby Aakankha is a prolonged stay at the NICU. Soon after Aakankha was born, she was diagnosed with severe respiratory problems and she was desperately gasping for breath. Reports revealed that her blood could not retain oxygen and the pressure in the vessels of the lungs was high - this made it difficult for Aakankha to breathe properly. She was put in a special kind of ventilator called the High-Frequency Oscillator and she had some respite. 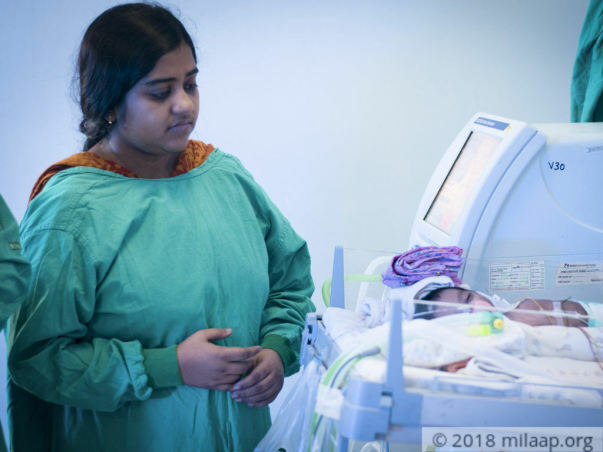 The mother and the child went home but just after four days, Aakankha started coughing constantly and she was admitted to the hospital again. This time she was diagnosed with pneumonia. "I keep asking myself if it was something that I had done wrong for which my little Aakankha is suffering right now. I am really weak after the c-section and even have infections from my stitches. So, I can’t even go to the hospital all the days. I have to stay back at home and all I can do is shed helpless tears for her.” - Ankita, mother. Baby Aakankha is too weak and is not able to breastfeed. Ashish has to arrange baby food everyday and even then she can’t consume the food. Her immunity is very low and if she is not kept in the NICU, she will pick up some other infections that can turn fatal. “When I first got to know about the seriousness of the illness I became numb. I did not have any strength to tell any of this to Ankita. The first few days I had to lie to her telling her that Aakankha had some minor respiratory problems and she will be fine soon. What else could I have done? She was not in a condition to bear the truth. But while she was being discharged, she asked about our baby and I had to tell her the truth. It was heartbreaking to see her break down and shattered completely.” - Ashish. Little Aakankha is covered in tubes and nozzles and it is painful for her parents to see their baby in this condition. Her tiny body is poked with needles everywhere. “Ankita had some complications during her pregnancy but she was very well taken care of. We had no idea that something like this would happen. Aakankha is our first child and we can't imagine losing her. 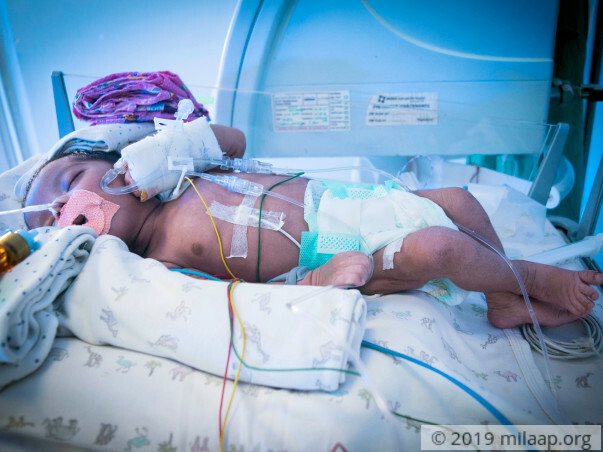 The only way she can survive is through the NICU care for a minimum of two weeks. But with my meager salary, I don’t know how we can make this happen.” - Ashish. 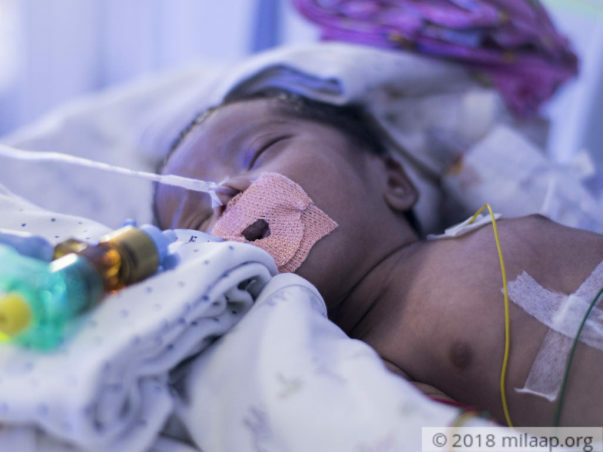 1-month-old Aakankha has acute pneumonia and severe respiratory problems. She needs to stay in the NICU for a minimum of two weeks. But Ashish, who is the sole breadwinner of his family, is short of funds. They have already spent more than 2 lakhs by borrowing from friends and family and another 3 lakhs from the fathers company as mediclaim. They need another 5 lakhs to continue the treatment in the NICU. Only your support can help these young parents to take their baby back home and live a normal life. Thank you for the love and support. 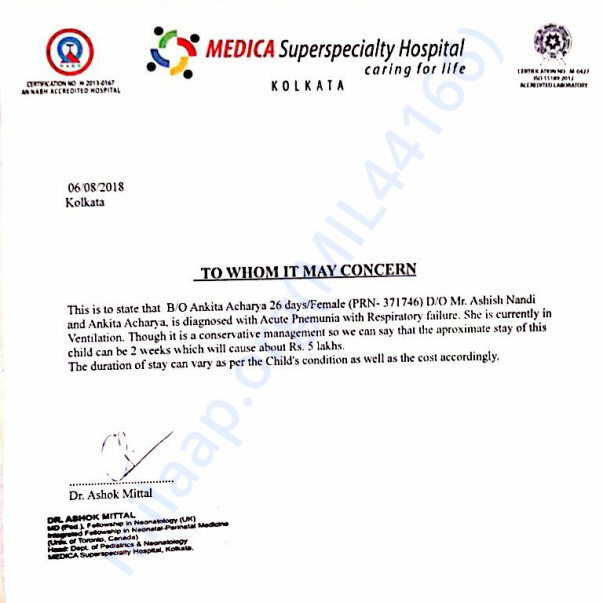 Here is a quick update on Aakhankha's health. Currenty, the baby is at home and doing better. Now she can breathe on her own without any ventilator support. Pneumonia has also been cured. She got discharged yesterday. Thank you once again for the support. Please pray for her speedy recovery. We will keep you posted on her progress further. Thank you so much for the support you have shown towards my baby. On the 12th the xray was fine and we were happy but today xray shown that infection increased and doctor informed us in any distress shown then they will act according by the symptoms. Please pray for my baby. Don’t lose hope, also ask the mother to take care of herself too.